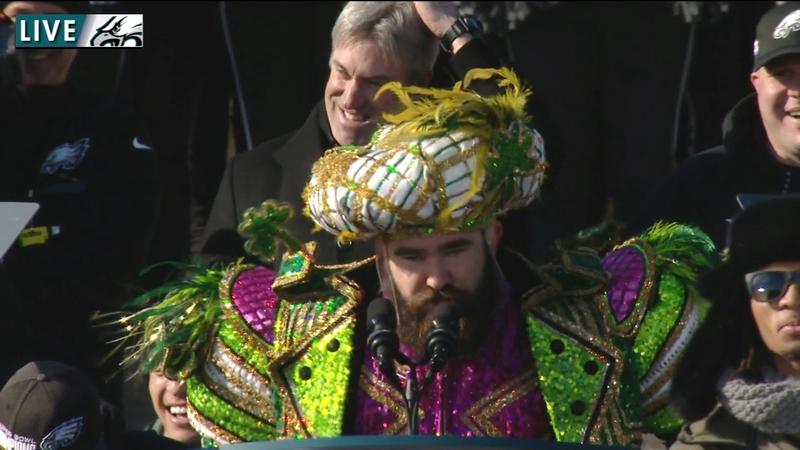 PHILADELPHIA (WPVI) -- Jason Kelce was able to borrow a costume from the Avalon String Band to wear for the Eagles Championship Parade. How did this happen? As the story goes, Jason has his hair cut by Libby Hitt and Libby's husband Bobby Coyle is in Avalon String Band. Avalon went through their storage of costumes and found "a large one" from their "Ire-land of Leprechauns" performance. The particular costume Kelce wore was worn by Jim "Big Smooth" Crompton during the band's 2008 New Year's Day appearance. Jason Kelce gave a passionate lecture on the meaning of the word underdog for Philadelphia.